To mark its five-year anniversary, Helena Mulkerns, its founder and MC, has edited an anthology that presents work by a selection of the writers and poets who have participated in the Cáca Milis Cabaret down the years. The book’s spirited and irreverent introduction by writer Patrick McCabe captures the impromptu spirit of the Cabaret itself and sets the scene for a dazzling gamut of writing. From short fiction to poetry, humour, satire and sci-fi musings, the book makes an eclectic and entertaining read. The broad range of contributors adds to its attraction, featuring local and international, emerging and established authors (see list above). Publisher Tara Press (www.tarapress.net), a new independent imprint, operates unreservedly on the basis of the “electronic publishing revolution.” It promises quality, eclectic writing – both re-publishing works by writers that are now out-of-print, and making available select original works. 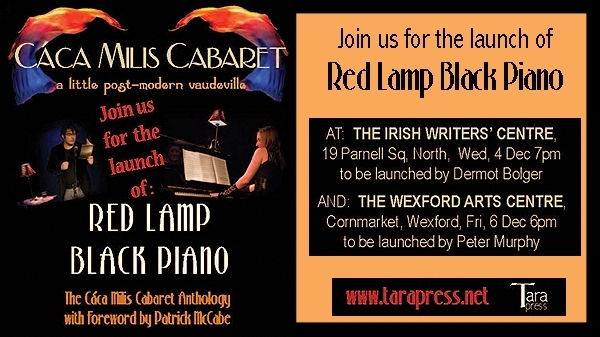 Red Lamp Black Piano will be available in paperback, Kindle and e-book versions via Amazon and other international online outlets, with traditional distribution via local independent bookshops and arts events. The book seeks to promote the Cabaret and the work of its artists, and to fundraise for the upkeep and development of the venture. A portion of the proceeds from sales at the Wexford launch will also go to a South-East-based suicide prevention group, Wexford MarineWatch. Red Lamp Black Piano will be launched in Dublin by author and dramatist Dermot Bolger on 4 December at The Irish Writers’ Centre, with the event kicking off at 7pm.